Yesterday I said no to the socks. I said yes to the shoes and even hot pink alternate laces, the custom orthotics molded while I waited, the “plantar fasciitis sleeves”, and the “foot log” massager. I was bug-eyed with heel pain and eager to open my wallet for relief. But I drew the line at the socks. Twice in fact; it’s as if your salespeople don’t hear me. At this point I was compelled to explain my stubborn decision. “Look,” I said, “I’ve tried the socks before, and quite honestly, I didn’t love them.” She didn’t want to hear anymore. She’d heard “no” and moved on. But I’d like you to hear why I wouldn’t even take your socks for free. Your socks are an overpriced mess. The “compression” in them gives me muffin top ankles. I don’t have cankles (the slang term referring to the look of a fat calf that transitions seamlessly to ankle; the two body parts becoming indistinguishable). But your socks gave me an indented line on my ankles, so I’ll go so far as to say they gave me faunkles (faux fat ankles). They made me breathe a sigh of relief when I peeled them off post-workout. And when I say peel, I don’t exaggerate. Your socks don’t flex, so once wet with sweat, they’re about as removable as a fruit roll-up off its plastic back. The material feels about the same. Is this even cotton?? It’s rough, and seems to become strained and angered when stretched. And the microbial chemicals? I wash my feet and I don’t share socks. Done. I’m aware of upselling schemes, because I had the bittersweet pleasure of working at a little bath shop called Garden Botanika, many years ago when I was in college. Now I know I’m digressing here, but let me take you on a retail journey with me. Circa 1995, I walked into the Garden Botanika store in some kind of shorts-meets-plaid-jumper torso-covering with a belt, navy tights underneath, and penny loafers. But the cherry on the top of this captivating TJ Maxx ensemble was the oversized, fuzzy, navy blazer. The two ladies behind the counter saw that blazer and were instantly impressed with me. My blazer oozed confidence and maturity, yet my 19-year-old face expressed fear of starvation and a burning desire to obey any rules for a paycheck. Though I was merely inquiring about employment and was just hoping to schedule an interview as I had with Abercrombie & Fitch, the ladies interviewed me on the spot and loved me enough to grant me the status of Keymaster. While I’d have to be trained on Keymaster opening duties, which meant in the beginning being taken under the wing of a Gatekeeper, the future looked bright. I’m not good at lying. I didn’t sell one. And I almost told the secrets to a few customers with it in hand. I didn’t want to sell objects tainted with lies. 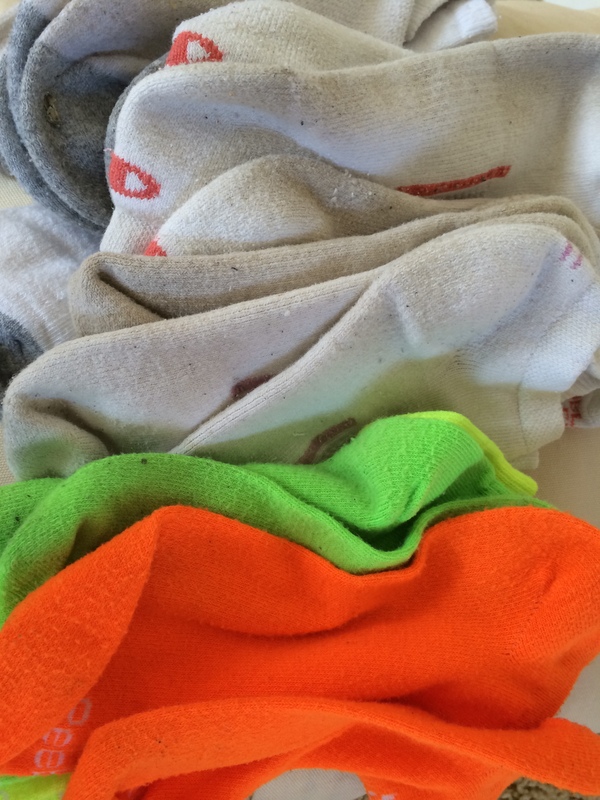 Just like the eye make-up remover, your socks are nothing special. The first salesperson told me the socks really helped with plantar fasciitis. Then murmured and laughed aside to a another employee, saying, “Just doing my job.” I checked the packaging on the socks while your employees walked away—nothing about plantar fasciitis was listed. If you wouldn’t mind adding this letter to my file, the one that notes my arch type, level of foot flexibility, pressure distribution, and other fancy diagrams, I’d much appreciate it. Also, maybe mark the top of my file “Do not solicit for socks.” Because if I get asked about them one more time, I’m likely to buy all of them I can afford, open a shop next door called “Jus’ Sox” (because needless abbreviation attracts exactly my target market), and sell each pair for 50 cents, driving down the cost of your dumb socks to the worth of the material. It would be worth the investment. And just for fun, I’ll put pressure on my employees to sell a Pez dispenser on every single customer transaction. Emily Schleiger is a writer in the Chicago area. Her work has been published on McSweeney’s Internet Tendency, Reductress, Second City Network, and HumorOutcasts.com. After surviving a short career in Human Resources, she has studied at The Second City and Gotham Writers’ Workshop. For more writing, check out EmilySchleiger.com and DontRepeatThisInPreschool.com. For her birthday she would love a drum set, but in the interim she’s just fine with smacking carrots against the kitchen countertop because she is adaptable like that. I always wanted to try compression socks. So, should I kiss them goodbye and spend on something else? Anything’s worth one shot. But whatever George Dubya said about getting fooled repeatedly and where the shame lies…yeah, that.